She wants a roadways quilt. In the encyclopedia of classic quilt patterns, there is a cool roadways pattern. However, I don't have the book and can't get it fast enough. Does anyone know of an online pattern (free or pay to download) that I could use for kids to race matchbox cars on? Thanks for your help. well, if you can't quilt one, home depot sells a rug with roadways on it. If you can find a picture of what you want you can probably make one yourself without a pattern. I did that for a baby quilt once. Then I appliqued a couple of cars on the road. Could you use a maze pattern and adapt it to your requirements with choice of fabrics? Then you would not be doing curves .... just a thought. There are several on pinterest. There are detailed directions on the moda bake shop blogspot. Last edited by MaryMo; 06-27-2013 at 06:50 PM. 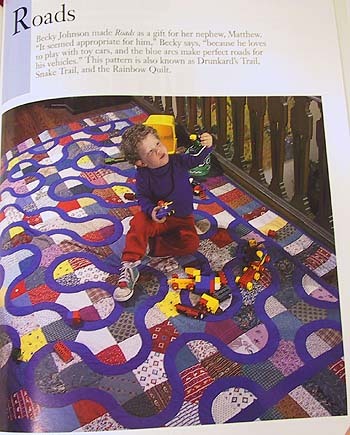 The quilt you reference has piecing in the background of the blocks and makes the roadway by color placement. look at tne weewonderfuls blog at oscars quilt and you can see it better. it also divides the background diagonally, so that each block uses four separates fabrics in the background, then to marching oueces for the arcs. It would be difficult to duplicate without curved piecing. What if you used large half square triangle blocks, joined them, marked the curves on the quilt top, then appliqued the "road" as a large meandering piece of bias? It wouldn't be exactly the same, but you would avoid the curves. Last edited by Krisb; 06-27-2013 at 07:12 PM. I arise in the morning torn between a desire to improve the world and a desire to enjoy the world. This makes it difficult to plan the day. Then wide stretch bias stitched or sewn on. You could attach the road by raw edge applique. Karen Combs has a book out with patterns for Celtic quilts. The patterns are easy to make and would be adaptable to make roads, and there wouldn't be any curves. Looks pretty easy to me, I think the road is just appliqued on. You could cut different "parts" to the road by tracing wooden train set pieces and create a cool curving road that way and then applique the whole thing on after it's pieced. You could even have the "background" squares be in greens and blues for grass and lakes. Applique road signs, cows in fields, etc. along the side of the road if you feel up to it. Just an idea. here is the Charming Maze one http://www.modabakeshop.com/2011/10/...aze-quilt.html go down past the last picture and click on Printer Friendly. good luck. I know this is in UK but you may have similiar.try this site; lady sew and sew. They have fabric with tyre treads cars houses etc. THANKS for everyone's suggestions. I have decided on the charming maze one. It looks like fun to make and relatively easy. I think my sister will be impressed. Can't wait to make it! !